Rose Community Foundation responds to immediate community needs like the September 2013 floods. We will always remember the devastating toll the September 2013 floods took on our Colorado communities. But with tragedy often come stories of compassion and cooperation. We experienced that here at Rose Community Foundation when so many connected to our organization came forward wanting to do something to help – people like Katherine Gold, Rose Community Foundation trustee and fund holder. 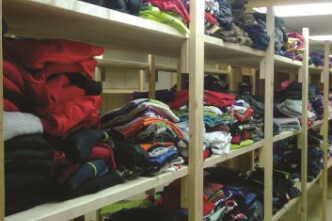 When Katherine heard that more than 1,000 children were left homeless in Weld County with nothing but the clothes they wore to school, she took action. Through Goldbug, her Aurora-based company and leading U.S. distributor of children’s accessories, Katherine contacted industry colleagues and arranged for more than 10,000 items of new children’s clothing, shoes and backpacks to be shipped to Greeley-Evans School District 6 for free distribution to families in need. Rose Community Foundation served as the local charitable conduit for manufacturers and distributors who contributed the goods. It was a remarkable example of many people, companies and organizations coming together in a time of great need to make a difference. Katherine’s story is just one of many ways our friends and family rallied in support. When we offered matching funds for flood relief donations, ten of our donor-advised fund holders and dozens of individual donors made contributions, totaling more than $45,000 in support. When we launched a new Colorado Funders Flood Recovery Fund in partnership with the Colorado Association of Funders, six local foundations banded together, contributing nearly $250,000 which will go toward long-term recovery needs. An important part of our work is being responsive to immediate community issues like the floods as well as the long-term impact, and we’re proud to support opportunities like these for others to make a difference. Learn about how you can help support flood recovery efforts at rcfdenver.org/floods2013. Make a donation or set up a fund at rcfdenver.org/giveandplan.